are slated to play at Glastonbudget (the largest tribute festival in Europe) in 2013. Since a new years eve party in 2007 The Darkside of Pink Floyd (DSOPF) has come a long way. The members recreated the classic Pink Floyd album The Dark Side of the Moon (DSOM). ‘The biggest challenge we had was that I we didn’t have a drummer in the family. So I took on that role and taught myself drumming while learning DSOM. Next in the long list of challenges to overcome was that key members of the band. Notably Dom and Chris Gill lives 300 miles away so rehearsal was mostly in subgroups or solo with the album. We did all got together 2 or 3 times during 2007 for weekend long rehearsals it was fun. From a music perspective the band focuses on replicating the best live versions of Floyd’s more modern works centred around the Pulse tour of 1993. Supplemented by other classic live performances such as the version of Echoes from Gilmour and Wrights 2006 ‘Remember that Night’ performance at the Albert Hall. 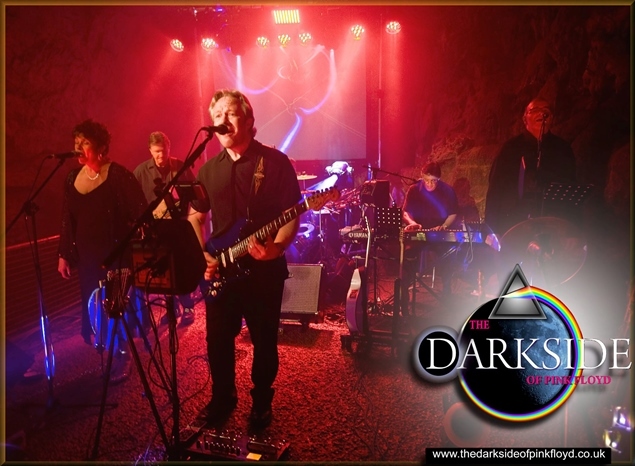 The set now comprises of over 2 and 1/2 hours of Pink Floyd music which can be cut and tailored to any event or venue. The band uses it’s own 2.6 kw PA and has it’s own lighting rig which is constantly being added to to create an increasingly ‘awesome’ show. Malcolm Pass, the sound and light engineer, has over 35 years experience in the ‘art of performance’ and he is certainly looked on as a very important 8th member. Over the past 4 years, the band has garnered quite a reputation as being possibly the most authentic PF tribute playing live at this time (2012/13). The band is not centred around the usual formula of 2 keyboard players, 2 guitarists a bevy of lady backing vocalists, a percussionist and/or a lead vocalist but they have tried, successfully, to keep to a basic 4-piece ensemble of guitarist, keyboard player, bassist and drummer with the addition of 2 exceptional narrative/vocalists and a seasoned saxophonist. This has urged reviewers/bloggers to acclaim the band as being authentic, original, emotive, fabulous, powerful and able to craft an intimate relationship with the audience to create an unforgettable live show.